Offering free WiFi and sea views Spectacular Wellfleet Waterfront is an accommodation set in Wellfleet. This property offers access to a balcony. This holiday home features 4 bedrooms a living room and a fully equipped kitchen with a dishwasher. A flat-screen TV is provided. Provincetown is 19 km from the holiday home while Chatham is 28 km from the property. 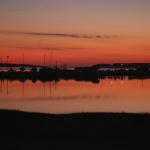 The nearest airport is Provincetown Municipal Airport 23 km from Spectacular Wellfleet Waterfront.